Download the Royal Links Golf Club mobile app to enhance your experience. Mobile apps contain many features like scorecard, GPS, tee times, news, deals and more! Click on the icons for more information and free download. Monuments were erected at various locations throughout the golf course indicating the spots where great moments in British Open history took place. A Champions Wall is erected near the all grass turf practice range honoring American champions of the British Open. Golfers may choose to engage the services of a professional forecaddie adding to the "Scottish" experience. These forecaddies are knowledge about the history of each hole, as well the location of the 108 pot bunkers, some of which are hidden. Walking caddies are also available and are required for those who choose to walk. Royal Links was recognized as the "Best Course in Las Vegas" in the 2006 Review Journal "Best Of Vegas" poll and one of "America's BEST Courses" by GolfWeek. Summer Weekday 18 Rates from $59. Take I-15 North to I-95 South. Take I-95 South to Flamingo exit, make a Left on Flamingo. Take Flamingo across Boulder Hwy to Nellis Blvd. Turn Left and proceed to Vegas Valley Rd., turn Right. Proceed one mile to entry gate on the Right. Take I-15 North to I-95 South. Take I-95 South to Flamingo exit, make a Left on Flamingo. Take Flamingo across Boulder Hwy to Nellis Blvd. Turn Left and proceed to Vegas Valley Rd. , turn Right. Proceed one mile to entry gate on the Right. Take I-95 South to Flamingo exit, make a Left on Flamingo. Take Flamingo across Boulder Hwy to Nellis Blvd. Turn Left and proceed to Vegas Valley Rd., turn Right. Proceed one mile to entry gate on the Right. Envision your group being greeted by an authentically-clad bagpipe player as they pull up to a castle-style clubhouse only minutes from the Strip in the middle of Las Vegas. That can only happen at Royal Links Golf Club. The Royal Links Event Services group is staffed by full-time professionals who live in Vegas and play Royal Links and who can make all the arrangements for your outing. They can fulfill your requirements for food and beverages, transportation, tournament scoring and formatting, prizes and more - even a bagpipe! You can count on them to make your golf group outing a turnkey, hassle-free, memorable experience. Looking for Intimate and Exclusive for your Special Day? If yes, come see the spectacular Royal Links Golf Club. 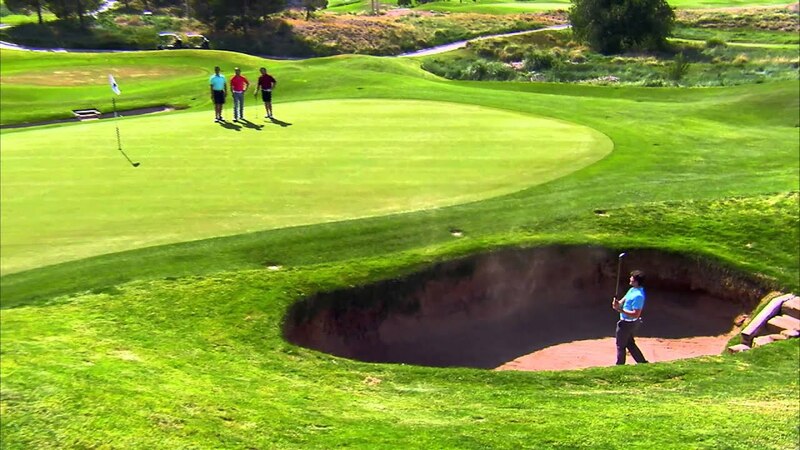 Royal Links is a nationally recognized facility that is unique to any where in Las Vegas. The clubhouse at the Royal Links is an authentic English Style Castle that sits behind the gates of one of America's Finest golf courses. With indoor/outdoor seating of 75 guests, intimate decor, fireplace, views overlooking the course, Las Vegas Strip along with Panoramic Mountain Views makes Royal Links the perfect place to say " I Do". Stymies PubStymie's Pub, located inside the castle at Royal Links Golf Club, is an authentic re-creation of a British pub complete with historic golf memorabilia and great panoramic views of the golf course. The pub serves traditional fare, including fish and chips, bangers, as well as breakfasts, salads, sandwiches, and the specialty of the house: Our homemade potato chips. Don't forget about the ice cold glasses of Guinness and Newcastle on tap! Stymie's comfortably seats at least 40 guests, with 10-12 seated at the bar. For your viewing pleasure, there are two flat-screen 42-inch plasma televisions running throughout the day playing your favorite sporting events. Watch the Parmates Caddy Program At Royal Links Video. Watch the Royal Links Golf Club Video. This profile was last updated on 12/21/2018 and has been viewed 12,031 times.